The Rapid Response Squad has released the photograph of Inspector Dania Ojo, said to be one of the six policemen who allegedly shot dead a 20-year-old girl, Ada Ifeanyi. A man who was with her, 32-year-old Emmanuel Akomafuwa, was said to have sustained life-threatening injuries as a result of the shooting that killed the 20-year-old girl, and is currently being treated at an undisclosed hospital in Lagos. 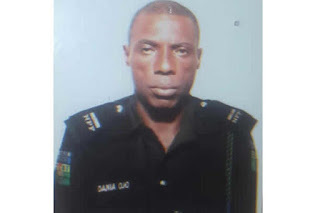 While five policemen have been arrested in connection with the Saturday morning incident, the sixth suspect, Inspector Dania Ojo, is said to be at large, having reportedly vanished from the scene immediately after the gruesome killing. The Lagos State Police Public Relations Officer, Bala Elkana, had revealed the names of fleeing Inspector Dania Ojo’s accomplices as: Inspector Adamu Usman, Sergeant Adeyeye Adeoye, Sergeant Kashim Tijani, Sergeant Lucky Akigbe and Sergeant Paul Adeoye, all of Trinity Police Station in Ajegunle area of Lagos State. Inspector Dania Ojo’s identity was unveiled via the RRS Twitter handle @rrslagos767, on Sunday.